Home » WELL-BEING » Do I need a colonoscopy? A colonoscopy is not a cure for anything. It is, however, a major step in finding out if there is something serious you should know about. If you can, then do consider having a colonoscopy (or endoscopy) done. Your doctor or GI specialist will most likely recommend one. Then you will know where you are. It stops the mind chatter and all the “what if….” questions and stress. Let’s face it, many of us imagine something serious like cancer. It’s good to know it’s not. Depending on where you live and what medical insurance you have, the cost of a colonoscopy will vary substantially. It may be free, or come at a price. I have seen posted on several sites that in the US currently a colonoscopy can cost around $3,000. If having a colonoscopy puts you in a very difficult financial situation right now, you should not worry overly about it. 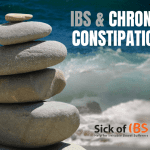 The stress of that situation could start off other medical problems or worsen your IBS. Try to plan for one sometime in the not-too-distant future if you can when you have better fortune. As said before, having a colonoscopy will not cure your IBS. Having a colonoscopy: Does it hurt? Medical science is fantastic. The fact that they don’t have to open you up to look inside is just amazing. However please know what it will be like and what to expect. Take the day off work, get your medication ready and have someone come and pick you up afterwards and stay with you for a while. A colonoscopy is not comfortable. You are swallowing a tube that is several feet long. I was not sedated and I felt totally sick throughout (I think it lasted about 20 minutes). My insides did not like having cells scraped off the walls for analysis, especially the parts that were inflamed. Also, my stomach did not react well either to having extra air pumped into it, and few hours afterwards my intestines and stomach were bloating and cramping so badly I felt like I was going to explode. My husband frantically called the specialist who said that this can be a reaction but it was “nothing to worry about” – and indeed it was not, but at the time it was a very stressful experience. I still don’t regret having had it. I found out that “I just had IBS”. The colonoscopy ruled out anything more serious that could have been going on and reassured me.